These six photos are from a day in August 2007 I spent in Yakutat, Alaska, near where the southeastern Alaska panhandle connects to the rest of the state. That brief visit was part of a week-and-a-half-long vacation covering various places on the south Alaska coast, and was my last stop in Alaska before flying back home via Seattle. Yakutat is isolated from the rest of Alaska, neither on the state's main highway network radiating from Anchorage and Fairbanks, nor on the extensive ferry network in southeastern Alaska; the only practical ways to get your car there are by freighter, or on the occasional ferry trips across the Gulf of Alaska part of the year. 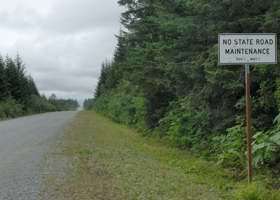 It does have its own small road network, with a paved road running about four miles between the airport and the harbor, a good but mostly unpaved forest road almost 30 miles east of town to the Dangerous River, and other shorter unpaved roads of varying quality to area beaches and other places. You can rent a beat-up car suitable for covering the road network, but local gas prices are really high due to Yakutat's isolation -- I paid $3.85/gallon regular unleaded (highest I've ever paid for gas), about 75-80 cents/gallon higher than I was paying in the Anchorage area, and 30 cents/gallon higher than I paid in the equally isolated Unalaska/Dutch Harbor out in the Aleutians. 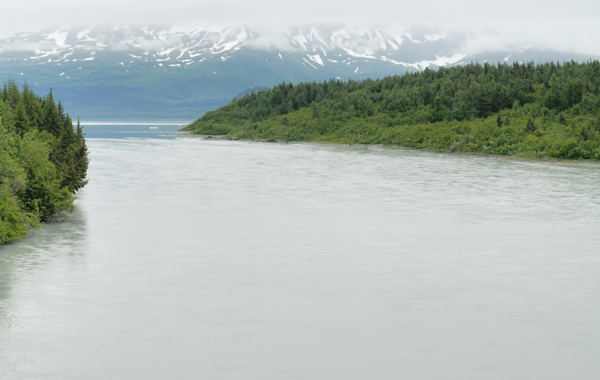 Yakutat is in the midst of some spectacular scenery, including several glaciers nearby as well as Mount St. Elias to the north (some can be seen on flights into or out of town, or on flightseeing tours out of Yakutat). However, the weather didn't cooperate on the day I was there (reportedly it often doesn't), with low clouds and occasional drizzle, so I didn't take a lot of pictures, nor could I do the planned flightseeing tour to the Hubbard Glacier north of town. 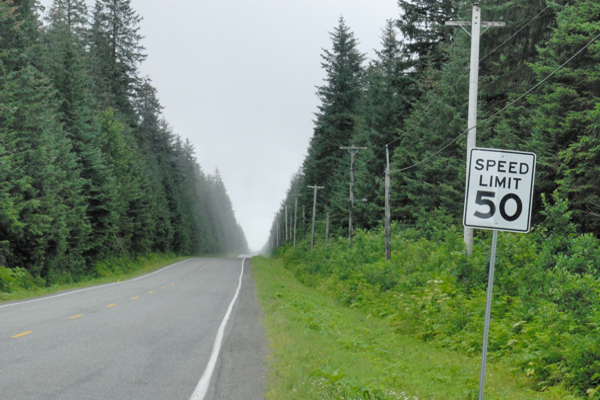 People spending more time there, especially if they're into fishing or surfing (yes, the waves can be pretty good up there -- but chilly waters, no surfing naked so close to the 60th parallel!) should have a better time, as well as more of a chance for the weather to clear up enough to view the surrounding scenery from ground level. NOTE: In case you want more detail, you can click most of the photos below to view enlarged, higher-quality (less .jpg compression) versions. Those alternate versions have larger file sizes, so please be patient while they download. 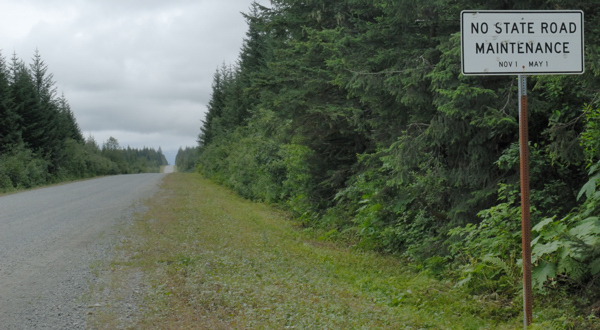 Airport Road, between Yakutat and its airport, is a year-round road with good pavement and alignment. Dangerous River Road is the other main road out of Yakutat. 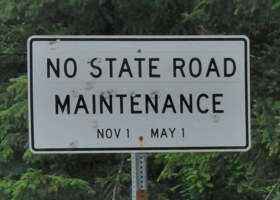 It starts off paved in town, but is a good unpaved road for most of its length of almost thirty miles (above left). 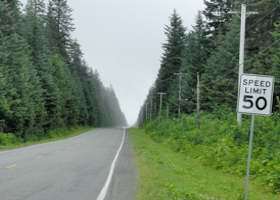 Past the town landfill at mile 1.5, the road is not maintained during the winter, which in Yakutat lasts around six months (above right). 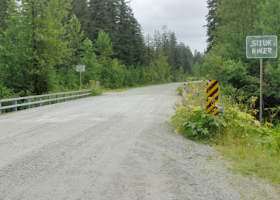 At mile 8.6, Dangerous River Road crosses the Situk River. This is a popular fishing spot -- including for bears who will try to steal your catch (so it's a good idea to stay near your car, in case you need shelter). After the road narrows around mile 26, it crosses the Dangerous River here at mile 29.4. The road dead-ends about 0.1 mile ahead. 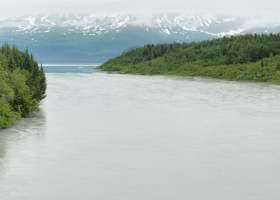 The river doesn't look too dangerous from the bridge -- though it is full of silt deposited by glaciers upstream, so it's not good for fishing. I understand that, much of the rest of the year, the river lives up to its name, with those glaciers sending icebergs downstream; even in early August, a little ice can be seen floating in the lake in the distance.